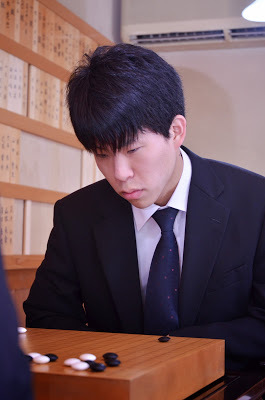 Chisato Cup: The semifinals and finals of this new tournament for young players were played in the town of Seiro in Niigata Prefecture on March 1 and 2, but I forgot to include it in my previous report. The favorite of the fans was probably Fujisawa Rina 2P (right), the granddaughter of Fujisawa Shuko, but she lost to Hirata Tomoya 3P in one semifinal. In the other, Suzuki Shinji 4P beat Kimoto Katsuya 3P. Suzuki (B) then beat Hirata by resignation in the final to take the first prize of two million yen (a little under $20,000). In my report on the opening rounds of this tournament, I made a bad guess, based on a Net search, about the business of the sponsor, the Chisato corporation. Apparently it is an insurance agency specializing in towns and village councils throughout Japan. Japan Eliminated from 2nd Bailing Cup: The qualifying section and the first round of the main tournament of this Chinese-sponsored international tournament were held at the Chinese Qiyuan (Ki-in) in Beijing from March 13 to 18. Seventeen professionals and amateurs from Japan took part in the qualifying tournament, but no one won a place in the main tournament, though Ida Atsushi 7P (left), Ichiriki Ryo 7P, and Son Makoto 3-dan did reach the final round. This is a massive tournament, with 64 players competing in the first round. Japan had three seeded players, but they were all eliminated. Their results: Zhang Tao 4P (China) beat Akiyama Jiro 9P (Japan), Mok Chin-seok 9P (Korea) beat Takao Shinji 9P (Japan), and Wang Xi 9P (China) beat Yuki Satoshi 9P (Japan). Twenty-two Chinese and ten Korean players proceeded to the second round. Incidentally, the two players fighting a jubango at present, Yi Se-tol and Gu Li, were both eliminated in this round. See also Battle for 2nd Bailing Cup Cup Begins 4/3 EJ. Ichiriki Sets Record: The first of the four vacant seats in the 39th Kisei Leagues has been taken by Ichiriki Ryo 4-dan (right). In the final, held on March 21, Ichiriki (B) beat Cho U 9P by 7.5 points. At 16 years nine month, he is the youngest player to win a seat in any of the three leagues. This feat also earned him an automatic promotion to 7-dan. The previous record for the Kisei Leagues was 17 years ten months, set by Iyama Yuta. Iyama still holds the Meijin League record, at 18 years five months, and Yo Seiki set a new record for the Honinbo League last year of 18 years two months. On April 3, the second of the vacant places went to Cho Riyu 8P; playing white, he beat Seto Taiki 7P by 8.5 points. In celebration of the 90th birthday of Nihon Kiin, a special summer go camp will be held from August 26 to September 4 in Tokyo. 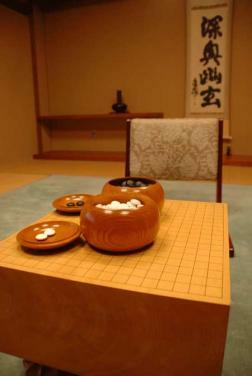 Included in the camp are daily pro instructions in separate dan and kyu sections, playing in the largest Japanese amateur tournament — the Takara Shuzou Cup, where the 1000+ participants will all receive special commemorative prizes — and visits to the Honinbo title ceremony, to Kamakura, site of the Go Seigen-Kitani jubango, and to Yugen no ma, the Nihon Kiin’s legendary tatami playing room adorned by a Kawabata calligraphy (right). The camp fee is between JPY 50 to 55K (about $500); housing starts at about $40 a night. The camp is recommended for players 10 kyu and up, including high dans. For further information and registration forms, contact igf@usgo.org. Humans Beat Computers in First “Igo Electrical King Tournament”: To test how close computers have come to human level at go, the first Igo Electrical King Tournament was staged in the top playing room, Yugen, at the Nihon Ki-in on February 11. Please take our word that “electrical king” (dennou) sounds better in the original. The program Zen played best-of-three 9×9 matches with Cho Riyu 8P and Hirata Tomoya 3P, but lost both without picking up a game. However, Zen lost by only half a point in its first game with Cho, and human commentators pointed out a winning sequence that it missed in the endgame. 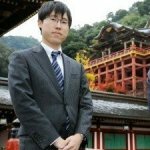 One of Zen’s programmers commented that it would still take ten years to catch up with pros in 9×9 go. Zen vs. Hirata Tomoya 3P: Game 1. Hirata (W) by resig. ; Game 2. Hirata (B) by resig. Zen vs. Cho Riyu 8P: Game 1. Cho (B) by half a point; Game 2. Cho (W) by resig. More games in this tournament were played three days later on 13×13 and 19×19 boards. On the 13×13, Emura Koki (W), a former WAGC representative for Japan, twice beat Zen by resignation. On the 19×19, Zen beat Ozawa Ichiro, a prominent politician. He is dan level, but we don’t know his exact rank. Kataoka Scores 1,000 Wins: A win on February 27 gave Kataoka Satoshi 9P (right) his 1,000th win as a pro, making him the 15th Nihon Ki-in player to reach this mark. It took him 42 years and his record was 1,000 wins, 530 losses, 4 jigo. Retirements: Two more veteran players have retired as of March 31. They are Ishida Akira 9P and Fukui Susumu 9P. 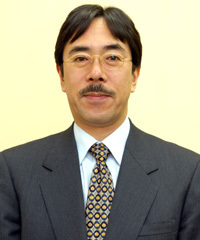 Ishida was born in Tokyo on May 23, 1949 and became a disciple of Fukuda Masayoshi 8P. He became 1-dan in 1966 and 9-dan in 1982. He won the top section of the rating tournament (Oteai) in 1972 and the 3rd and 4th King of the New Stars titles ((1978 and 1979). He played in six Meijin leagues and one Honinbo league. 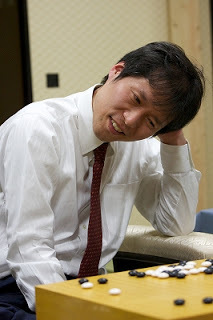 At his peak, when he played in the Meijin league for six years in a row, Ishida impressed as one of the top players on the go scene, but he never put it together to win a big title. Fukui was born in Tokyo on May 21, 1947 and became a disciple of Iwamoto Kaoru. He became 1-dan in 1965 and 9-dan in 1994. His older brother, Masaaki, is still active. Takao Makes Good Start To Judan Challenge: The first game of the Mori Building Cup 52nd Judan Best-of-Five Title match, to give the tournament its full name, was held on March 4, and the challenger, Takao Shinji 9P (left), got off to an efficient start by picking up a win by a half-point margin. The first game was played, for the fourth year in a row, at the Osaka University of Commerce; the president of the university, Tanioka Ichiro, is a scholar of games in general and has recently published a book on early go history. The defending champion, Yuki Satoshi, seemed to take a lead in the opening, but Takao narrowed the gap through tenacious play and overhauled him in the end game. Takao had white and won by half a point after 303 moves. The second game will be played on March 27. Kato Evens Score In Women’s Meijin: It has become the custom to hold the first game of the Women’s Meijin title match in conjunction with the first game of the Judan title match; it was held at the same venue, also for the fourth year in a row, on March 5. This year Kato Keiko 6P (right) was the challenger and was playing in her first title match for five years. She had just taken the winter off to have her second child (her husband is Mizokami Tomochika 8P) and she brought her daughter with her to Osaka, so she was quite busy. Kato, who drew white, played a little erratically at the start of the game — perhaps the lack of recent match practice told on her — but she found a chink in Xie’s armor and made the game close. However, she missed a good opportunity to strike as severe blow, and Xie seized the lead once again. This time Xie played tightly and forced a resignation after 195 moves. The second game was played on another campus, that of Heian Jogakuin Daigaku in Kyoto on March 12. The name translates as Heian Women’s Academy University but in English it is known as St. Agnes’ University. This was the third year in a row that the second game of this title match had been held there, in the Arisu-kan, a traditional Japanese building. Kato followed a strategy of avoiding fighting, which is Xie’s forte, so the game was not a spectacular one. Kato’s policy worked well until she let herself down with a couple of slack moves, but she was able to stage an upset in the endgame. Xie’s losing move was, in a sense, typical of her: she chose an endgame move not for its size but because it threatened the eye shape of an enemy group. However, Kato cleverly expanded the territory of another group with a move that provided a sente threat to secure eye shape for the group under attack. Playing black, she won by 1.5 points after 253 moves. The deciding game will be played at the Nihon Ki-in on March 24. New Tournament Launches: A new tournament, the Tournament Winners Championship, has started. It is open to all title winners from 2013 plus a player chosen by a vote by go fans (13 players in all). The winner receives the Prime Minister’s Cup and the Minister for Education and Science’s Diploma. The first two rounds were held on February 14 and 15, with Yuki Satoshi Judan (left), Yamashita Keigo Ryusei, and Kyo Kagen, Nakano Cup winner, winning places in the semifinals. There they join Iyama Yuta, holder of six titles, who was seeded. The games were played on the Net, with time of 30 seconds per move plus ten minutes of thinking time to be used in one-minute units (the NHK format).The semifinals and finals will be held at the Nihon Ki-in on March 22. The 16-year-old Kyo, who was born in Taiwan, will play Iyama in one semifinal, and Yamashita meets Yuki in the other. Yamashita Keeps Lead In Honinbo League: Yamashita Keigo (left) started out and ended badly in his Kisei challenge, but his form in other tournaments has remained good, especially in leagues, where he is bidding to win three in a row (starting with last year’s Kisei League). 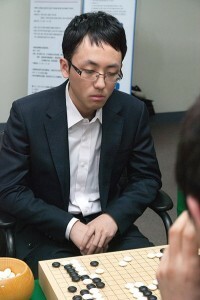 After six rounds in the 69th Honinbo League, he is the only undefeated player. He will meet his only remaining rival, Ida Atsushi 7P, in the final round in April, but Ida will have to beat Yamashita twice in a row, that is, in this game and then in a play-off, to become the challenger. Regardless of what happens, Ida has made a very good debut by winning five games to one loss against top-level competition. Among the other league members, two top players are enjoying different fortunes. A sixth-round win ensured Cho U’s survival, but his defeated opponent in that game, Takao Shinji, has lost his place. (February 13) Yamashita (B) beat Kono Rin 9P (W) by 1.5 points; Ida Atsushi 7P (W) beat Sakai Hideyuki 8P by 5.5 points. (February 14) Yuki Satoshi 9P (W) beat Takao Shinji 9P by 1.5 points. (February 20) Yo Seiki 7P (W) beat Cho U 9P by resig. (March 6) Ida (B) beat Kono by resig. (March 7) Yamashita (W) beat Sakai by resig. (March 13) Cho U (B) beat Takao by 3.5 points. player, though his score is only 3-0, as he has already had his bye. His closest rival is Kono Rin 9P on 3-1, but the other two players to have had byes so far, Cho U 9P and Ryu Shikun 9P, also have only one loss. Yamashita’s games with Kono next month and Ryu in May will be significant. (February 17) Yamashita (B) beat Ko Iso 8P by resig. 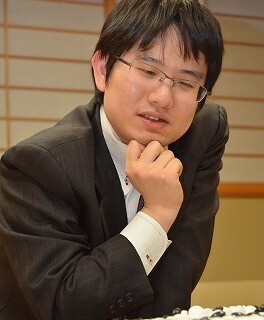 (February 20) Ryu Shikun (B) beat Takao Shinji by 1.5 points. (March 10) Kono Rin (W) beat Yuki Satoshi 9P by 2.5 points. Iyama Defends Kisei Title, Defeats Yamashita 4-2: Iyama Yuta swept to a 3-0 lead in the 38th Kisei title match, but then Yamashita made a comeback, saving two kadobans (games that can lose a series) to keep the match alive. However, the tide turned again in the sixth game, with Iyama outfighting Yamashita to defend his title 4-2. This is Iyama’s second Kisei title, his 7th big-three title and his 23rd title overall. He also maintained his sextuple crown. To take up the story from my previous report, the fourth game was played at the Hokkaido Hotel in Obihiro City in Hokkaido on February 20 and 21. Yamashita (white) had his back to the wall, but he played in his usual aggressive fashion and took the lead in the middle game. He suffered a number of losses in the endgame, but just managed to hang on to a half-point lead. The game ended after 243 moves, with Yamashita looking relieved that he had kept the series alive. He comes from Hokkaido, so he also made local fans happy, and the sponsors were probably also relieved that the series hadn’t fizzled out. Incidentally, this win redressed the balance for Yamashita’s half-point loss in the first game. 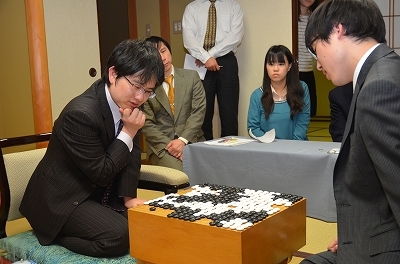 The fifth game was played at the Atami Korakuen Hotel in Atami City, Shizuoka Prefecture on February 26 and 27. Yamashita took the lead in a fight centered on a ko and then coolly wrapped up the game. Playing black, he won by 3.5 points. He was still one game behind, but his successive wins put a lot of pressure on Iyama. On the evening of the first day, Go Seigen, who lives nearby in Odawara, visited the tournament venue to look at the game and to chat with the players. Go will turn 100 on May 19 and is already the longest-lived top player in history, but he still takes a keen interest in the go scene. The sixth game was held at Ryugon, a traditional Japanese inn with a large pond and extensive garden, in South (Minami) Uonuma City, Niigata Prefecture on March 12 and 13. Iyama (B) played well and was never behind; he decided the game when he skilfully resurrected a group of three stones that he had ‘sacrificed’ in the opening. This secured a resignation after 229 moves. This series was yet another good demonstration of Iyama’s fighting power. Yamashita is known for his fondness for fighting, but Iyama matched him blow for blow. Yamashita’s current results in other tournaments show that he’s in good form, but he was able to take only two games off Iyama. 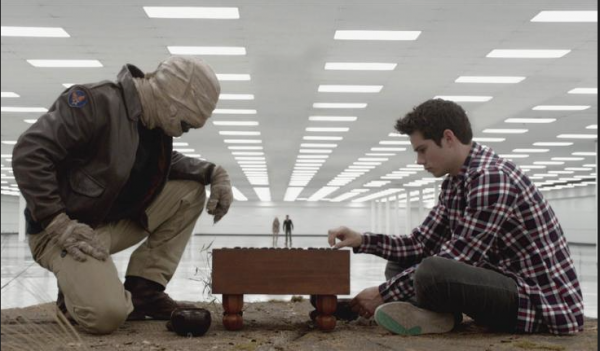 Turns out the board position in episode 22 of Teen Wolf (EJ 3-12-14) is from a real game. “I had the pleasure of setting up the go board for this scene, and I got paid for it too,” reports 2012 AGF Teacher of the Year Joe Walters. “The empty triangle is a real move. The game was between Michael Redmond 9P and Chino Tadahiko 9P on March 15, 2012, in the B section of the Meijin. I set the game up for the scene sometime before Xmas last year, they provided the board and stones. I did it on the floor in the room where they shot the scene, but not on the tree stump where they used it in the final scene. Someone took pictures of the board, and they duplicated the setup when they shot the scene later on. They just wanted a game that looked real, so I selected that one because it was by an American 9 dan pro and had only a few moves,” said Walters. Save $50 USD by registering by February 28 for Maeda Ryo 6P’s 3-week intensive go camp in Osaka, which runs June 29 through July 19. Osaka Go Camp activities include intensive training by Kansai Kiin professionals, the opportunity to play go at the Kiin with professionals, play against top amateurs and former inseis, as well as sightseeing, cultural trips and making new go friends. The camp is sponsored by Kansai Kiin and the Osaka University of Commerce. Email osaka.go.2014@gmail.com for more info or to reserve your space. Iyama Leads 3-0 In Kisei Title Match: The 38th Kisei title match feels as if it has barely started, but it might be almost over, as defending title holder , has raced to a 3-0 lead and just needs one more win to stay on top of the rankings for another year. The second game was played at a traditional inn called Yamaya in Kawagoe City, Saitama Prefecture, not far from Tokyo, on January 29 and 30. Yamashita Keigo, the challenger, made an uncharacteristic mistake in the opening, letting Iyama take an early lead. Iyama then gave him no chance to recover, playing solidly in the early middle game, then aggressively later on in order to wrap up the game. 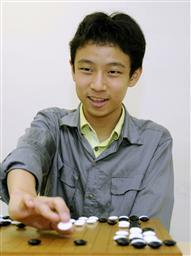 Yamashita, who had white, resigned after 167 moves. There was only a week for Yamashita to recover before the third game, and that doesn’t seem to have been enough. The match moved to the city of Kumamoto, about halfway down the western coast of the southern island of Kyushu. It was played at the Kumamoto Hotel Castle on February 6 & 7. Early in the middle game, Iyama (W) invaded Yamashita’s moyo and cleverly dodged when Yamashita attacked him. By the time he had settled his group (on move 60), the game had already tilted in his favour. As in the second game, Iyama played aggressively instead of coasting when he thought he had an opportunity to settle the game. Once again, Yamashita got no chances to pull off an upset and had to resign after 140 moves. Two convincing wins in a row by Iyama, following a close contest in the opening game, have now put the challenger under intense pressure. For the fourth game, the match goes north to Yamashita’s home ground of Hokkaido; it will be played on February 20 and 21. Kisei Game One Trivia: As reported in the E-Journal, Iyama won the first game by half a point. Although that may seem like a close margin, it was what professionals call a ‘thick’ half-pointer, that is, Yamashita had no chance of winning, though he did catch up a few points in the endgame through slack play by Iyama. Game One was one of the events celebrating 400 years of relations between Japan and Spain. 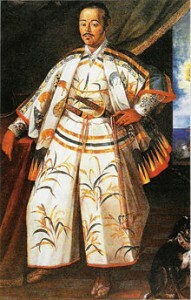 Last year was the 400th anniversary of the visit to Europe, including Spain, by a mission from the Japanese daimyo Date Masamune (whose headquarters was Sendai). It was led by Hasekura Tsunenaga (left) and traveled both ways via the Spanish colony that is now Mexico. The main aim was to visit the Pope, but the group spent seven years in Europe, including a visit to Spain. (It’s worth looking up Hasekura on Wikipedia for some nice illustrations.) Holding the first game of a best-of-seven title match (and occasionally games from best-of-fives) overseas has been popular, but this was actually the first Kisei game to leave Japan for four years (the overseas host in 2010 was Taipei). The Kisei/Yomiuri Newspaper group received a very warm welcome in Madrid. Just to give one example, the group was given a private after-hours tour of the Prado. Yamashita and Cho U Share Lead in Meijin League: Three games were played in the 39th Meijin League on February 6. Cho U 9P (W) beat Ryu Shikun 9P by 7.5 points; Takao Shinji 9P (B) beat Kono Rin by resig; Hane Naoki 9P (W) beat Yuki Satoshi 9P by resig. The only undefeated players are Cho U and Yamashita Keigo, but they have only a provisional lead, as they have played only two games. Kono and Takao, both on 2-1, could join them at the top. Shi Yue Wins New Year’s Tournament: The CCTV New Year’s Cup is a special tournament held to celebrate the Chinese New Year. Last year only Chinese players took part, but this year it has been upgraded into an international tournament, with a name change to the 2nd CCTV NY’s Cup Japan-China-Korea Tournament. It was won by Shi Yue 9P (right), who at present is rated number one in China. Second place was taken by Murakawa Daisuke 7P of Japan and third by Yi Se-tol 9P of Korea. Actually the sponsors wanted to invite Iyama Yuta from Japan, but it was impossible for him to find the time. Murakawa performed very creditably as substitute. In the first round, he lost to Shi Yue but put up a good fight. In the second round, he beat Yi Se-tol (who drew the bye in the first round); this probably ranks as Murakawa’s most prestigious win to date. In the final, however, he was outplayed by Shi. This may be an unofficial tournament, but first prize was an impressive 80,000 yuan (12 million yen or about $120,000), which would place it sixth among the Japanese titles. It was held from February 2 to 4, with live telecasts every day (apparently a first for a go tournament at this time of the year). A Promotion and a Retirement: Son Makoto has earned promotion to 3-dan with 40 cumulative wins. Tokimoto Hajime 9P has retired as of January 31. Born in Okinawa, Tokimoto became 1-dan in 1968 and reached 9-dan in 2005. He won the top section of the rating tournament in 1977. Tokimoto’s forte was ultra-fast quick games; at ten seconds a move (in unofficial games), he was almost unbeatable.